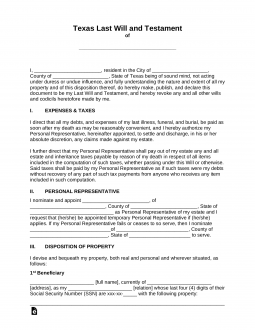 The Texas Last Will and Testament is a legal document that reflects the final wishes of a testator with regard to their estate and how they would wish that estate to be distributed to its beneficiaries. This document would be created not only for the purpose of continuing to provide for their immediate and extended family members but also friends and institutions that may be of importance to them. The property listed in this document is generally distributed by a trusted executor. Distributions may be those of personal property, real estate, fiduciary or digital assets among others. As the testator completes his decisions, the document must be signed by two witnesses and all signatures will require notarization. The document, as long as the testator is of sound mind, may change or revoke this document at their discretion at any time. Definitions – Estates Code, Subtitle F.
Signing (Sec. 251.051) – Must be attested by the Testator and by Two (2) or more credible Witnesses who are at least 14 years of age and who subscribe their names to the will in their own handwriting in the Testator’s presence.